Discontinued due to no longer having this device. Video by me on Nexus 7 2012 - How about a like? Hi Guys! I've ported MIUI v6 4.3.23 to the Huawei Ascend P6. At the moment the only official ( beta ) build is for the Nexus 7 2013. This build is really, really buggy. Nothing works. It is not ready for users. Please bare with me, I have to port from a beta build, from a tablet. Once MIUI v6 is officially out it should go much easier! At the moment this is a Pre-Alpha build, I already know how to fix a few bugs, which I will do as soon as I get time. Thanks to @surdu_petru for Omni ROM 4.4.2 base. BIG THANKS to @timmytim for help! As I've said before, but I emphasize it this is ONLY for people who want to help killing bugs. This ROM can't be used at the moment, almost nothing works. As you can see the low-level things are working. Camera, Sound etc. So most of these bugs are because I am porting from a tablet ( Without RIL! ) I am now busy fixing most graphical bugs, that should go quick. The notes app for example, MIUI made it tablet aware, so when it is on mobile it works 100% Perfect, since it can see it's mobile. - Some other apps are only tablet ( like settings ) These will be harder to fix. Will you give a download link now or when it is almost stable? Removed quote sorry for that. Please remove quote, don't quote the whole OP. I am providing a very unstable link, but it's only for users / developers who think they can fix some bugs. Is it based on Stock Firmware ? Once it's officially released we can use the MIUI Patchrom Project and base it on Stock. Glad to see you got it booted! Have fun! Thanks for porting this ROM. Don't go breaking your phone, but always have fun! I already squandered some bugs! Also I updated to the new 4.4.01 ! I don't think it is going to be so hard to fix RIL! 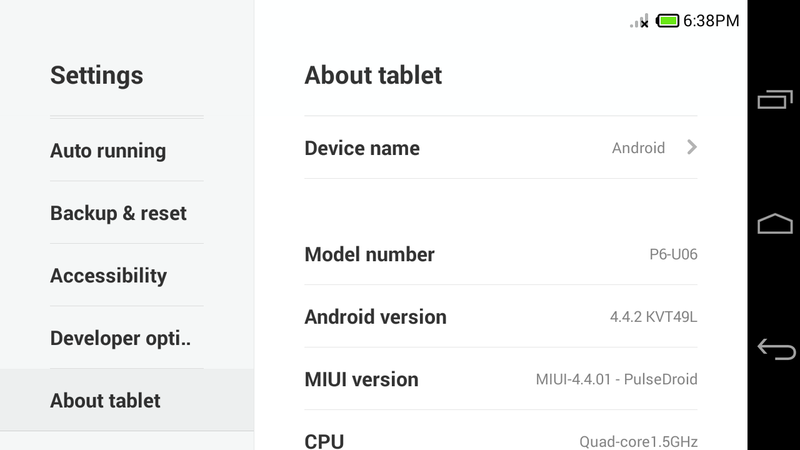 Only problem is the tablet only apps, those I think I have to wait for MIUI to update. Here is an example, when you rotate your device on settings, you see it looks perfect, because then there is more screen real-estate. I think because this is still a Beta they are focusing on tablets.